A shorter, more shade-tolerant Joe Pye weed. An easy-to-grow plant that is covered in clouds of dusky pink flowers in the summer. 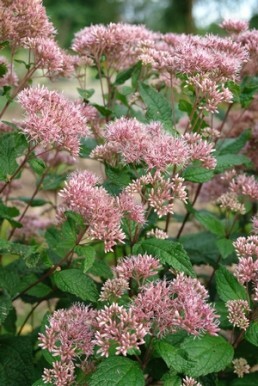 Joe Pye weed is one of the best plants for a summer pollinator garden. Eutrochium dubium is similar to Eutrochium purpurea but is shorter and more tolerant of shade.